If you don’t know who LondonFoodie is, then let me introduce you. He is a fabulous food blogger who bravely quit his investment banking job last year to take up his calling in food. A foodie journey to Japan ensued, during which time he sampled his way around the many delights in the cities of Tokyo and Kyoto, all of which you can read about on his blog. This year he became a student of the esteemed Le Cordon Bleu Cookery School to study for his Grand Diplome. 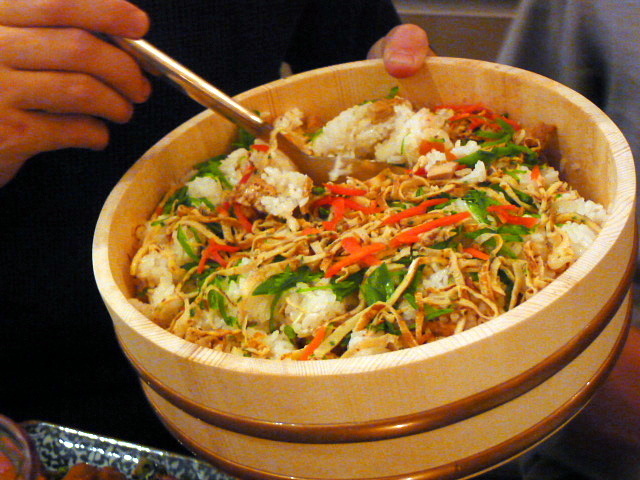 He also has a new venture, the London Foodie Japanese Supper Club. The menu includes a five-course tasting, and ever the gracious host, diners firstly gather for canapés and drinks before heading to dinner in the dining room which runs adjacent to the kitchen and where guests can ogle at the most massive aga cooker imaginable. 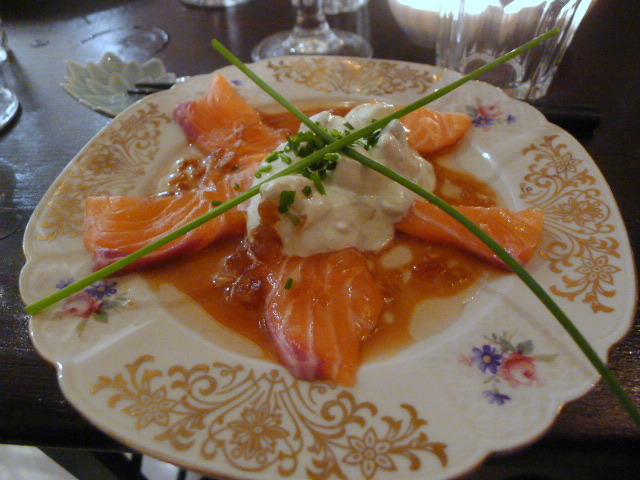 I recently attended one of LondonFoodie’s Japanese Supper Clubs which kicked off with a South American styled salmon sashimi accompanied by a wasabi flavoured sour cream, shallot chips, chives and a Japanese vinaigrette. The salmon was beautifully fresh, the cream and chips added a lovely creamy and crunchy textural contrast, and the vinaigrette provided a nice acidic zing to the dish. Next was a duck egg onsen. 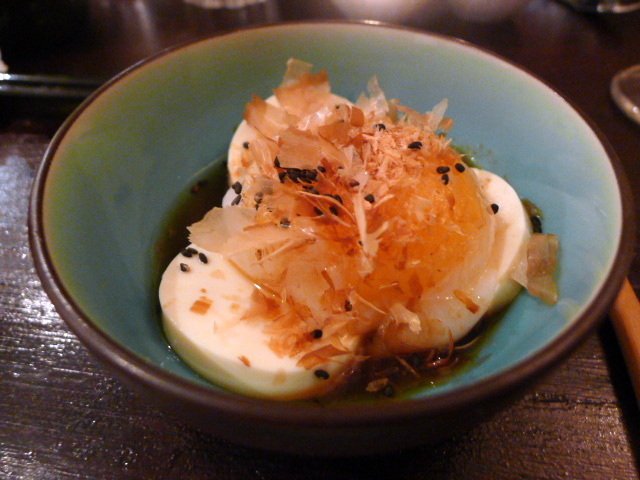 The egg had been cooked sous-vide for 45 minutes at 64c and was served with a lovely dashi, mirin and soya sauce dressing and katsuoboshi (dried fish) flakes on a bed of glorious silken tofu. This was a wonderful dish with lots of warm contrasting flavours. Also delightful was a dish of meaty scallops with a spicy homemade mayonnaise and wasabi flavoured tobiko (flying fish roe) on a bed of sushi rice. 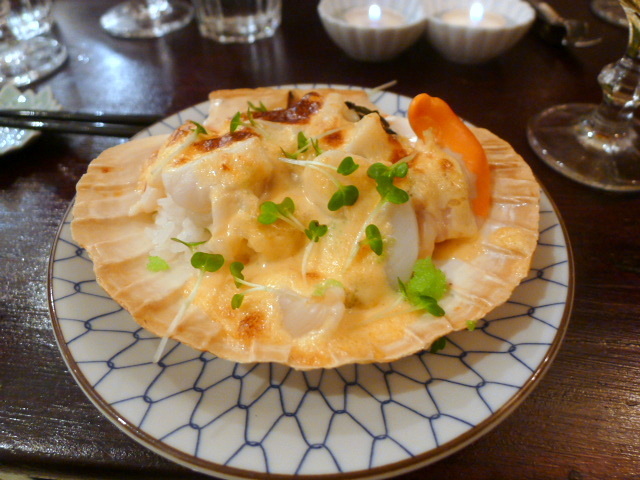 The dish was delightfully creamy and tangy, and it worked perfectly with the delicious scallop. This was a fabulous course and incredibly satisfying. 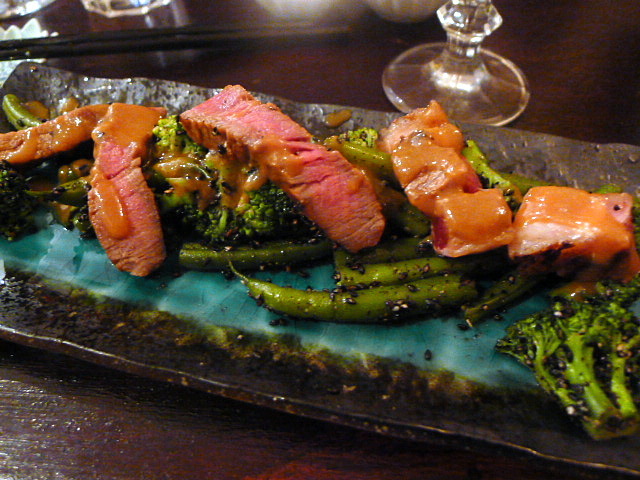 Rib-eye steak marinated in miso, sake and mirin was cooked to a beautiful medium rare and came with broccoli and green beans in a black sesame dressing. On the side was a sharing bowl of chirashi zushi, a rice topped with scattered sushi toppings, and a tasty abura-age tofu, spring onions and spinach miso soup. 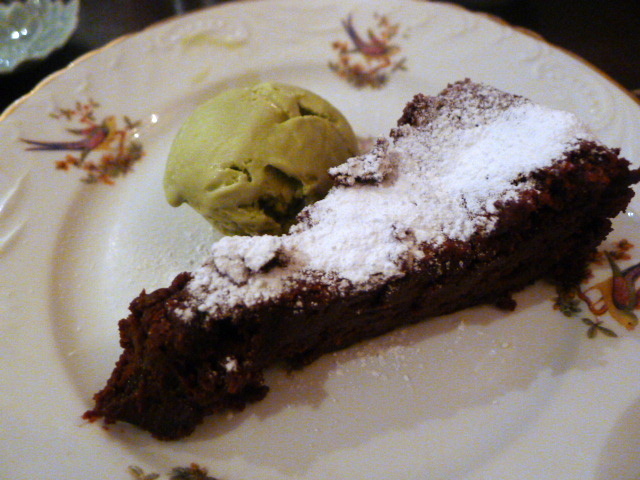 For dessert was a rich and moist fallen chocolate and Armagnac prunes soufflé with green tea ice cream. The pairing worked well together. This was a fabulous menu cooked with precision and care and using only the best ingredients. Wines are BYO, and there was a recommended payment of £38 for the menu which I thought was great value considering the quality of the produce, the generosity of the portion sizes, the variety in the dishes and the calibre of the cooking which was of a professional standard. The setting was great too (you have to see LondonFoodie’s house to really get a sense of how beautiful it is), not to mention the great company of the food-loving guests that were my dining companions that night. This meal was worth every penny. Highly recommended. Price range: £38 for canapes and five-courses. Excludes service. Drinks are BYO.